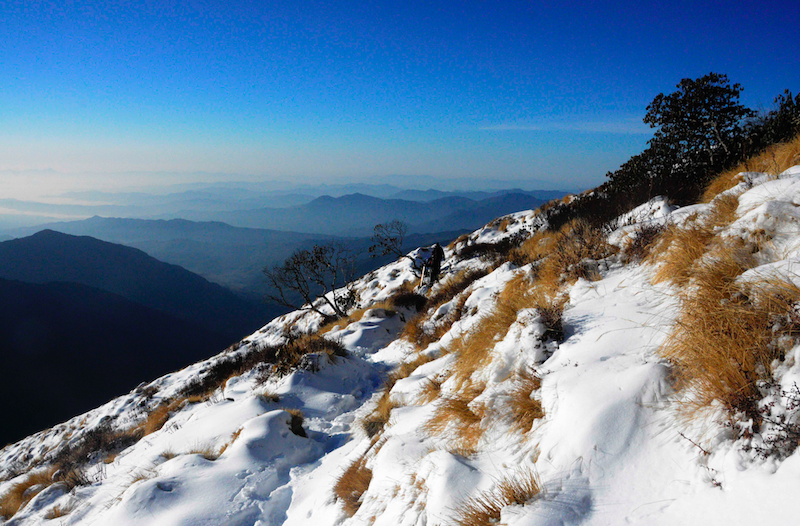 The appeal of a lesser-travelled trekking destination took me to the Mardi Himal Base Camp. Part of the Annapurna Conservation Area Project, the Mardi Himal trek not only offers amazing views of the mountains and local culture, but also glimpses of the flora and fauna of the Annapurna region. On 27th January 2017, My friend and I left Kathmandu on an evening bus, and got off at Kaadey, on the Baglung-Pokhara Highway, about 7 hours’ drive from Kathmandu. A hike of about 1.5 hours up stone steps took us to the Australian Camp, where we spent the first night. We left the Australian Camp before dawn the next day, with the goal of making it to Pitam Deurali (2100 meters) for sunrise. The trail is mostly through the jungle, with stone steps making a rough staircase. The hidden forest and thick canopy barely lets any light enter the forest, let alone the view of the mountains. Near Pitam Deurali, Machchapuchhre rises above the landscape, and a quick turn in the trail reveals one of the most majestic views of South Annapurna. We reached Pitam Deurali right before dawn, as the golden light of the sun just started to paint the clouds on the horizon and on the peaks of the snowcapped mountains. We watched the stunning sunrise over Pitam Deurali while eating breakfast. The majestic scene exceeded our expectations, and the rays of the sun falling on the white-capped peaks of South Annapurna was straight out of a painting. After spending considerable time in Pitam Deurali, we made our way to Forest Camp. The trail ascends through a thick forest and rises gradually, with an occasional view of the mountain ranges to the left. For most of this part of the trek, the mountains hide behind the forest landscape. Yet the greenery and silence is also beautiful, with the sounds of nature all around. Barking deer, chattering monkeys and chirping pheasants are common noises, with the occasional chittering of squirrels. The trail continues through thick forest until the Forest Camp (2480 meters). A small settlement in the middle of the jungle, the Forest Camp is a nice resting place to cool down and glimpse the open sky, before more walking in the forest ahead. The walk from Pitam Deurali to Forest Camp is long, about 4 hours without any teahouses in between. The steepness of the trails means that you’ll likely be hungry by the time you reach the Forest Camp. After filling our stomachs with dal bhat, we proceeded along the trail. The trail climbs steeply through dense forest, and soon the teahouses of the camp are far below. 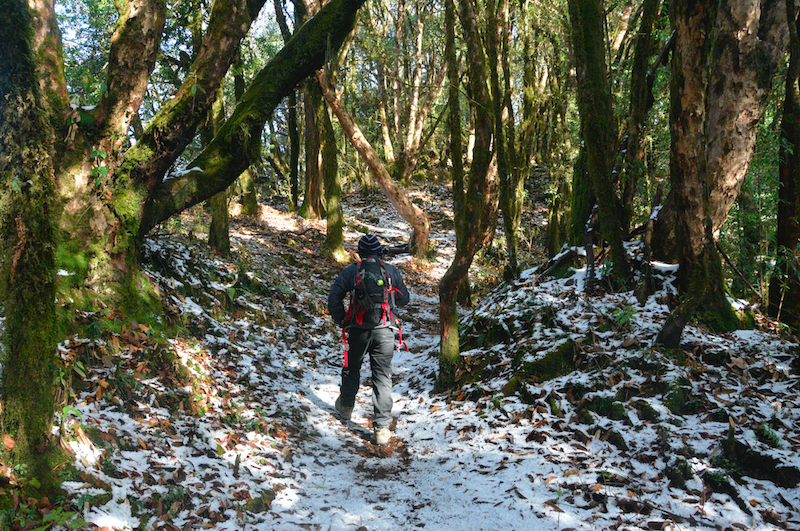 Once we reached the top of a hill, the trail became covered in thick snow, as it had rained and snowed the day before. The snowy trails started as low as 2300 meters. From there, it was an endless walk in the snow until reaching the High Camp. The melting snow made it hard to walk, and the melting ice from the trees kept falling on our heads. Some chunks were large enough to hurt. Through the snowy forest we reached Low Camp (3450 meters), about two hours after leaving Forest Camp. The view of Machchapuchhre from Low Camp was one of the best views of the whole trek, and the mountain forms a backdrop behind the teahouses. The camp was completely covered in snow, with no mud or grass visible. After a quick stop to refill our water bottles and enjoy the view, we set off to the High Camp. Although it isn’t far from the Low Camp, the excessive snow on the trail made the short trek treacherous. There was almost nine inches of snow on the trail, and the melting snow made it even tougher to walk. As we ascended higher, the snow was thicker and the views became more amazing. With every step we could sense that we were an inch closer to South Annapurna, Gangapurna and Machchapuchhre. An uphill walk of about half an hour took us to a small viewpoint, from where the view of both the mountains and landscapes was absolutely amazing. 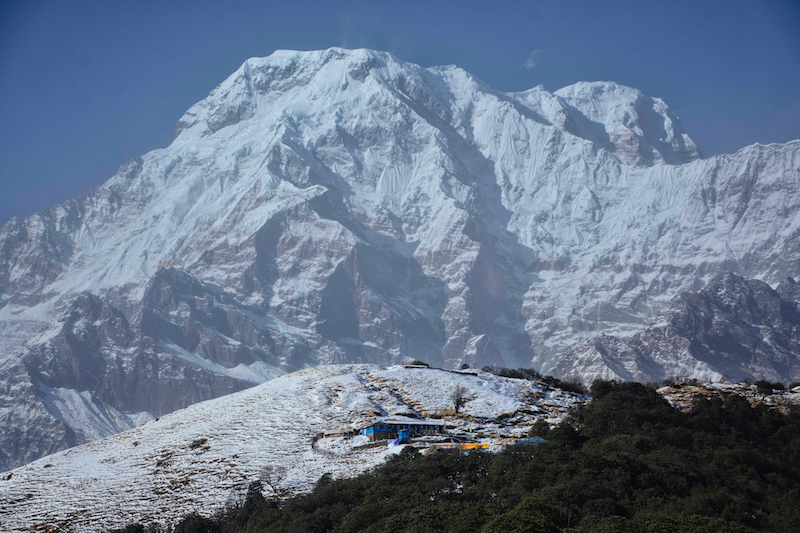 Right in front of was the Badal Dada, a small house sitting atop a snow covered hill, with the massive South Annapurna looming behind. The village of Ghandruk lies way below, to the south-west of Badal Dada. The trails got even more tiring as we went higher, as we had now walked for over six hours, and the snow had finally started to melt through our boots. The cold wetness of the snow had reached our feet. The path became even more slippery, but the cold in our feet was neutralized by the majestic view of the landscape and mountains. At the end of almost 8 hours of long trek up the hill, far in the distance we saw the shining blue steel roof of a house—we were almost at our destination. Walking along the thin trails thick with snow, and with little room for error, we finally made it to the High Camp (4100 meters) . It was almost dusk, the sun was near the horizon and we were ready to call it a day. We reached the hotel just before nightfall. There were plenty of people in the dining room, warming themselves in front of the heater. We needed to soak our socks and dry our shoes too, and we jumped right in front of the heater. It was then, while talking to other trekkers, that we learned it would be impossible to reach the Base Camp because of the heavy snow. A trekker who had tried to reach Base Camp that day told us that there was almost a foot of snow past the high view point. He had had to return because it was impossible to see where he was going. There was just too much snow to risk it. Even the locals suggested not going further. We were saddened by the news: all this for nothing? But we were determined to give it a shot, so decided to wake up early in the morning. We asked the hotel owners to pack us some eggs and tea. We started at the break of dawn and headed towards Mardi Base Camp. On the trail outside the hotel was almost a foot of snow, so we decided to wrap our legs with plastic bags. This turned out to be very effective. The trail to the Base Camp ascends gently for a short time. 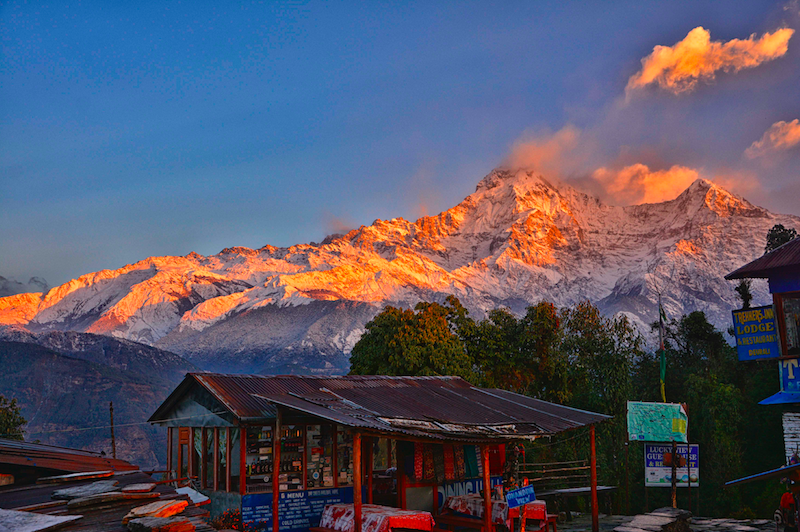 A point on a trail overlooking the High Camp teahouse is an amazing spot to view the sunrise and the mountains, offering some of the most striking views of South Annapurna and Machchapuchhre. From there, the trail rose, fell and leveled out. The snow became an obstacle. We pushed our way through the snow, and at times had to literally crawl through the snowy stones. The chill in the hands made it hard to hold onto the stones. We walked for a considerable time from the High Camp. We should have been very close to the Base Camp, but the amount of snow on the ridge near Base Camp made it extremely hard to keep going forward, so we sadly had to return to High Camp. The descent was arduous. We slipped many times, fortunately in safe areas. In a few places the ridge was steep and narrow, with a huge drop below. Slowly and carefully we dropped down to the high camp. It was sad to come so far and not even reach Base Camp, but the risk was far too great. Back at the High Camp we packed our bags and started the long journey back down. It was almost the middle of the day and the teahouse had emptied as everyone was returning back down. The trail had gotten even more arduous as the snow was melting, plus the footsteps of so many trekkers had made the path extremely slippery. We skidded at times, slipping much of the way to Low Camp. From there we descended to the village of Siddhing, instead of going back to Forest Camp and Australian Camp. The trail from Low Camp to Siddhing (1750 meters) was completely downhill, and after about twenty minutes there was no more snow, just stone steps through the dense jungle. The hilltop upon which the Low Camp sits was visible in the distance, with Machchapucchre to the side of it. It didn’t take long to reach Siddhing, and from there we made our way to Lumre, about two hours walk from Siddhing. From there we could get a local bus back to Pokhara the next day. All in all, this was one of the best treks ever. 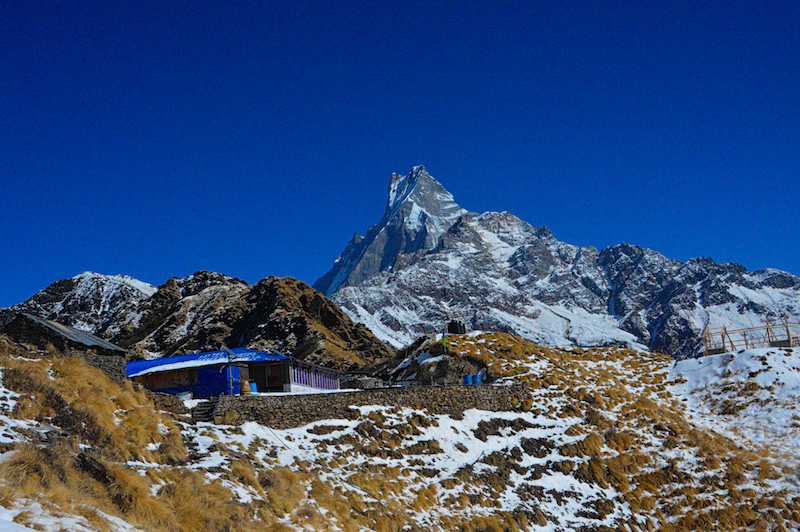 The Mardi Himal Base Camp trek is definitely a promising trekking destination. It offers amazing insights into the ecotourism side of trekking in Nepal, and unbeatable views of South Annapurna, Gangapurna and Machchapuchhre. The trail is not crowded, and the short trek can be done in little time. Anuj Ghimire is an Ecologist by profession. 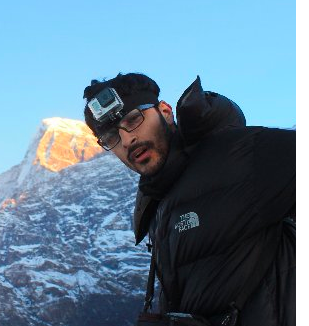 He loves trekking and has been working on mountain ecology and wildlife of various Himalayan regions of Nepal. Turning his passion of travelling and adventure into his profession he has been working as a writer and content curation at UpEverest.